As if I didn't have enough reasons to avoid the water. Motivation: Greed and territoriality. Even at birth, dragons know their place in the world and that's to get as much as they can and carve out a territory to defend against others who want everything they've gotten. 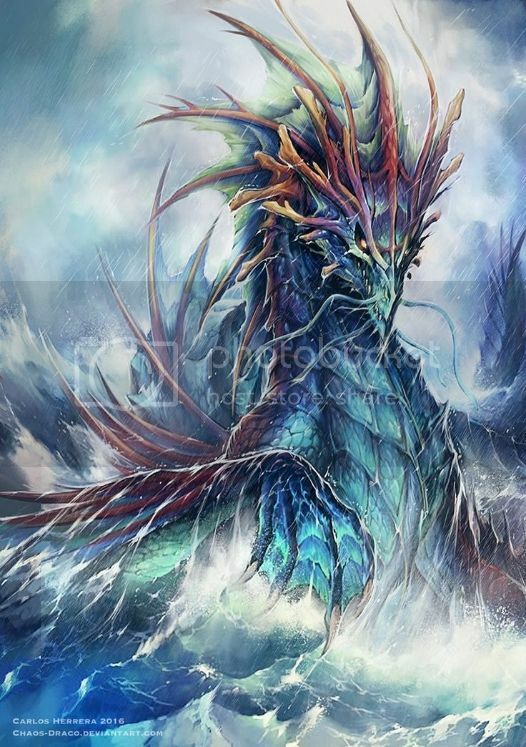 Power Loss: A hatchling Sea Dragon must wait 2-3 rounds (GM rolls 1-10 [3 rounds], 11-20 [2 rounds]) before using their breath weapon or Steam Bite again. Reputation: THE monsters of the world. Vulnerable: Sea Dragons cannot survive out of water for long. After 15 minutes all their abilities are impaired, after 30 minutes they are disabled, after an hour they are dying. Comments: Earlier I had said I was going to be limiting the number of dragon types in Gloriant. But I felt like I was remiss in not having Sea Dragons when I did my other dragon runs, just in case I actually do a sea adventure thingy. 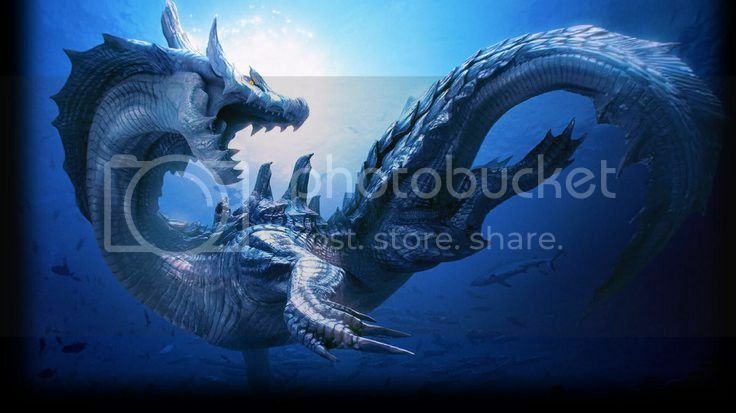 So here there are, starting with this old Sea Dragon, which is a beast. Comments: The ancient Sea Dragon, the subject of many mariners nightmares. The ones that lived, anyway. Power Loss: A must wait 1-2 rounds (GM rolls 1-10 [2 rounds], 11-20 [1 round]) before using their breath weapon again. 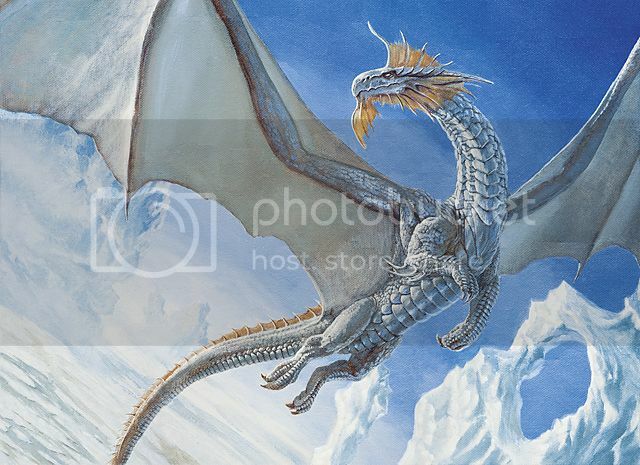 Comments: Storm Dragons are normally found in the cloud realms of the Storm Giants or in the highest peaks of mountain ranges. Some find their way into other areas of the world, often for greed or curiosity. They are generally blue-ish in color, but some have beautiful silver scales. Their cousins in Tarkir are more of a reddish color and have four wings instead of 2. 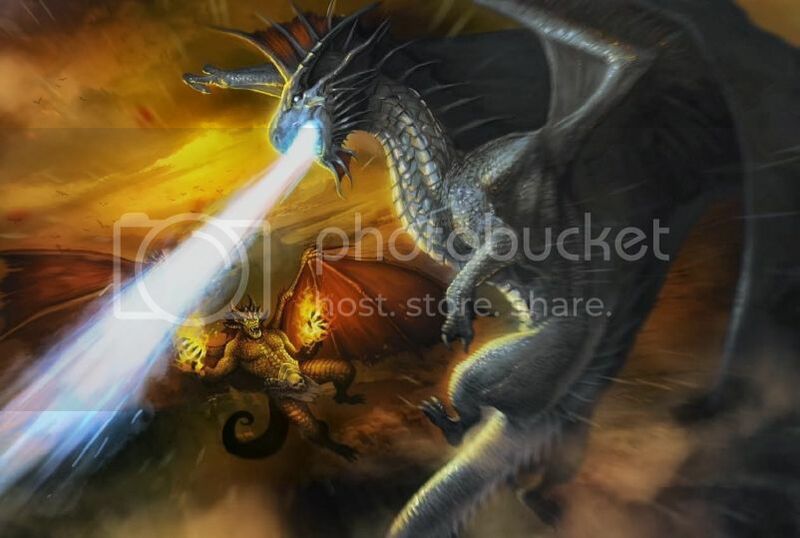 Power-wise, they rival the great Fire Dragons but due to their mystic ties to the weather, they exhibit a far wider range of powers, especially as they age. 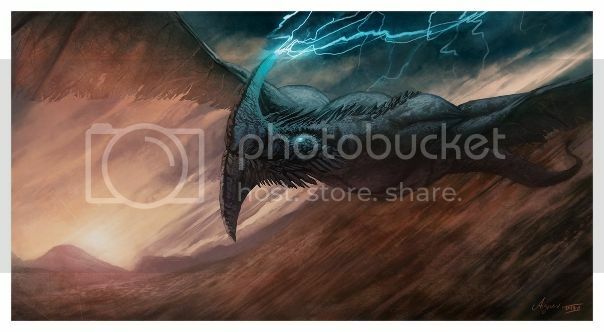 Some ancient Storm Dragons have learned magic spells that give them vast weather controlling abilities. And give it up for Lena Horne, everyone! One of the legendary American beauties. Last edited by Thorpocalypse on Sat Feb 17, 2018 5:55 pm, edited 1 time in total. Comments: A Storm Dragon at the height of its powers is a terror to behold. They rival the Fire Dragons for pure power and have a few more effects at their disposal. Throw in the fact that some are even more intelligent and have learned more weather controlling spells along their way and they are a foe few adventurers (or superheroes) can defeat. Motivation: Greed and territoriality. Even at birth, dragons know their place in the world and that's to get as much as they can and carve a territory defend against others who want everything they've gotten. 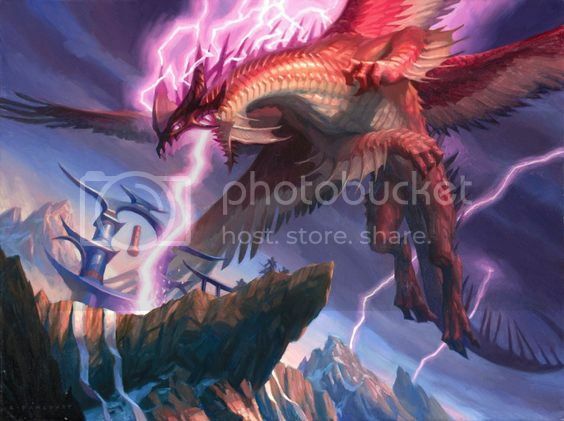 Power Loss: A Fire Dragon must wait 1-2 rounds (GM rolls 1-10 [2 rounds], 11-20 [1 round]) before using their breath weapon or Flaming Bite again. Vulnerable: Fire Dragons are vulnerable to cold based effects, taking an extra degree of failure against them. Comments: I swore I was going to limit the types of dragons in my fantasy setting and for a brief time, I held true to it. And then I became myself and the types started to grow and grow and now here I am, building chromatic dragons. Oh well, to thine own build whoring self be true, I suppose. 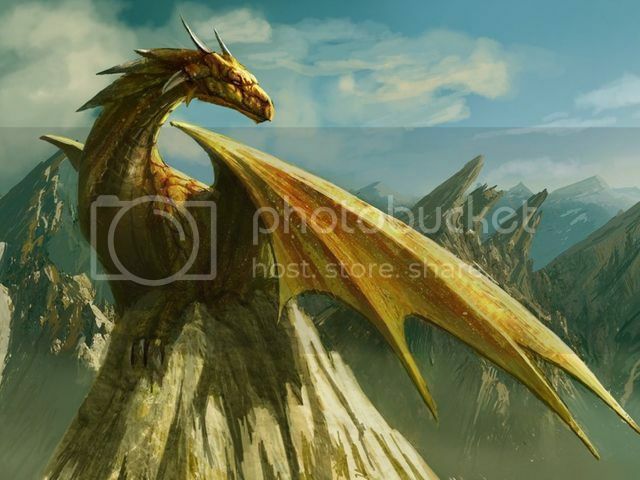 Gold Dragons are top of the line dragons like the Fire and Storm and are well known for being the opposite in temperament from the Fire breathing cohorts. But one of the things I don’t want to fall into is everyone of a type of creature being the same “alignment” so some Gold Dragons are dicks, just like members of every species. And they are definitely arrogant, even if they are generally benevolent. 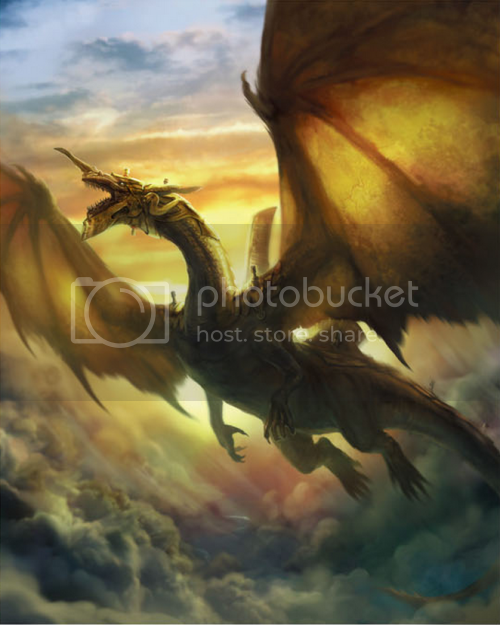 Comments: Ancient Gold Dragons are very powerful, equal to the Fire Dragons in strength and breath weapon and have the extra trick of the Weakening Gas. I thought about going with a true weaken effect, but I borrowed P-Ducks take as an Affliction, which I like a lot. On an unrelated side note, my 81-year-old father LOVES Bruno Mars. He recorded this video off of BET and plays it all the time. Cracks me up. Comments: Silver Dragons are close in power to the Gold Dragons, but I put this just a half PL below in most areas. But they are still pretty formidable foes, as are all the dragons. Silver Dragons in my world are definitely the paladins of the dragons, most very honorable and strict worshippers of Bahamut. Does that demon really think he's going win this one? Seriously? Comments: The highest of the Silver Dragons (mostly), the ancients. Like I mentioned in the old version, these are slightly below the Gold but still nothing to take lightly. And that's it for the dragons for now. I have a few more I'd like to do, like Sun Dragons, Death Dragons and others, not to mention Tiamat and the rest of the Dragonlords but that can wait for a bit. The next big run will be demons in a little while after I get them reworked. I might post a couple for testing purposes earlier, but for now, I'll be dropping more varied creatures and NPCs as I have time after some playtests. and I'm the same with Dragons who I LOVE in my campaigns I usualy limit them to the 5 chromatics gold and silver and Tiamat and Bahamut and dragon turtles. 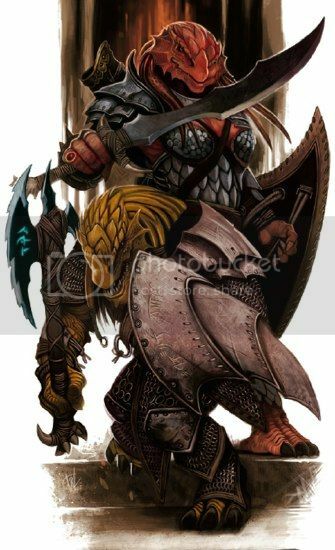 Monstrous Appearance: Dragonborn's draconic appearance can make it difficult for them to blend into human society. Comments: I’ve loved Dragonborn ever since they were introduced. What’s funny is that while I have faced several, and built a couple in both D&D and MnM, I’ve never actually played one. I may have to rectify that in my new FTF group. Disability: Wyverns cannot speak humanoid languages and cannot use their wing talons to easily manipulate objects. Comments: Wyverns are really what I thought fantasy dragons should be, except for the lack of flame breath. But they are fun mid-level beasts to throw at your foes, and that tail stinger is wicked bad. I don't think there's any race whose basic concept is quite that cool but whose introduction into the lore, specifically in the Forgotten Realms, was so bloody infuriating that it soured the well on them for me almost completely. They exist in this weird category where I kind of want to like them because they are pretty cool, but can't really muster up any real ability to. Love Wyverns. 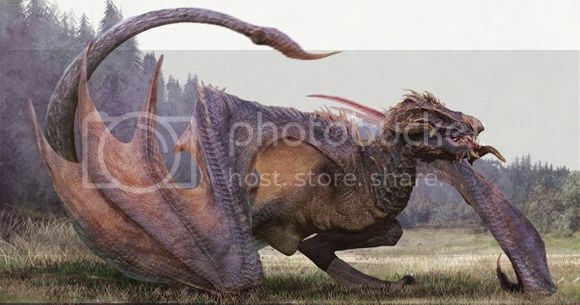 They basically exist for the same reason Drakes do- they're the "dumb dragons" some people prefer, rather than the dominating, intellectual types D&D uses. I noticed you had done the watcher, so I had to look up my old build. I must admit my build was more "movie" oriented, but we're vastly different as well!